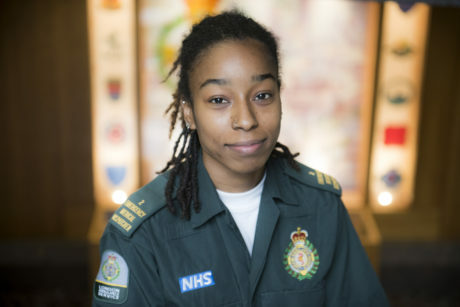 Nikki left law and accounting behind to join us as an emergency medical dispatcher in our control room. She says she goes home every day feeling she has helped someone. I have a degree in law and accounting but I wanted to do a job with purpose so when I saw the job advert online I applied for it. It was the best job interview I’ve ever been to – I think that was because I really felt the job was for me. There is an assessment to make sure you’re competent at typing, taking notes and listening. If you get through the assessment you are invited for an interview. When you start the job there is a very intense training period in the classroom. It is thorough and it teaches you what you need to do, but nothing can really prepare you for actually doing the job in control room. After about six months of call taking, you go back to training school to learn more responsibilities so there are good opportunities to progress. I’ve learnt a lot. There is so much that the public don’t know about the ambulance service. I like that I’m helping people. When there’s a difficult call, there is satisfaction in knowing you were the first point of contact and that you made a difference. Describe a day in the life of an Emergency Medical Dispatcher? Every day is different because every call is different. Sometimes you get silly calls where people don’t need an ambulance, sometimes you get a day full of silly calls but on other days you might have five cardiac arrests. At the end of each day I do feel like I have helped someone. What advice do you have for someone thinking about joining the Service? I do tell people this is a great job to do but it’s not for everyone. Not everyone can handle things in the same way. You need empathy and you need to know how to speak to people. Sometimes you need a quiet voice; sometimes you need to be assertive. Most importantly, you need to care enough.